Chi Sao Board - board for practicing the technique of chi sao wing chun, blocks and strokes. An indispensable tool for training conditions without a partner. On the board are also practiced all kinds of blocks and wing chun elements. The rubber pad softens the impact surface, so you can work at full strength. Springy hands attach special importance to the development of technology. Handles are deflected at any angle and give a sense of slip that reflects the contact of a real partner. 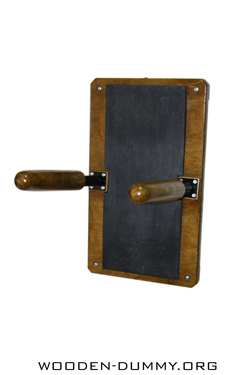 Unlike a static dummy, where the handles have low mobility, the Chi Sao Board will be an excellent addition for extending the practice of sliding blocks and shocks.